Since we’ve been traveling through Hawaii for the last 4 March is for Making blog post, I thought why not keep traveling, but this time to Japan. Today’s inspiration comes from Sarah Sutter. Sarah is a high school art and design technology teacher at The American School in Japan in Tokyo. Sarah has been part of the Create Make Learn Summer Institute since 2014, helped lead the laser cutter workshop last year, and is coming back to help lead even more advanced workshops. As today’s inspiration, Sarah shares her 9th grade students first laser cut project - acrylic phone stands. We’re so lucky to have Sarah Sutter share how her students approached this inspiring project in this STEP BY STEP video. 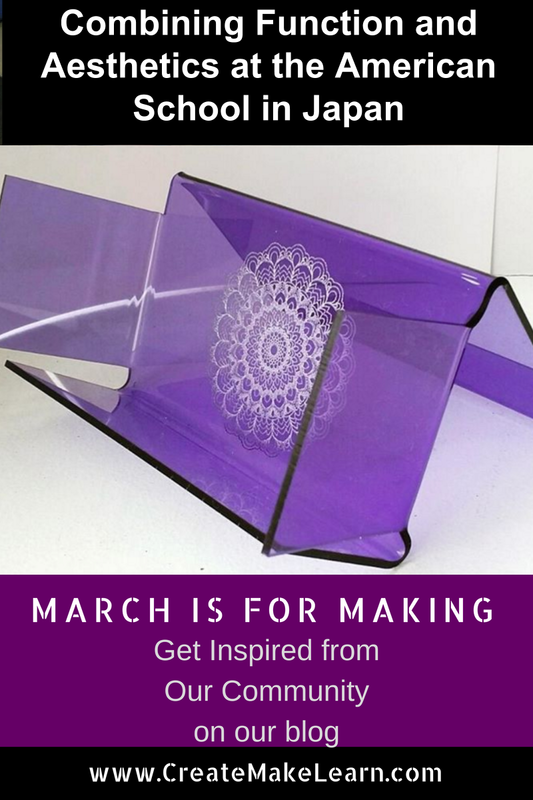 Thank you Sarah for creating this Step By Step video as part of March is for Making Series of inspiration. 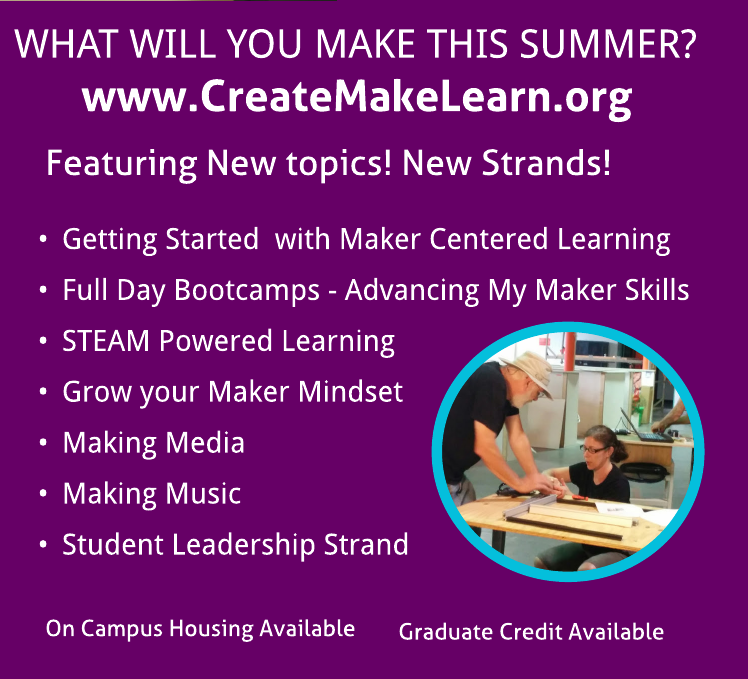 I know so many educators who are looking forward to learning even more advanced maker skills from you this summer at Create Make Learn Summer Institute. Sarah spends most of her year working with students as a high school art and design technology teacher at The American School in Japan in Tokyo. Her school has a new Creative Arts Design Center, which has 6 rooms dedicated to creative uses of design technology, engineering, computer science, robotics, basic electronics (etextiles and arduino, mostly), etc. with a focus on design thinking, maker mindset, fab lab concept, empathy, user experience, project based and challenge based collaborative learning. The center is equipped with 5 laser cutters (50 and 75 watt epilogs), 10+ 3D printers, 5 othermills, a handful of vinyl cutters, a full size and a small size shop bot, and the materials budget for to meet the individual project needs during the semester. The design program is now 4 years old, starting in 2013-14 at the 6th grade level, which then expanded to 7th (2014-15) and 8th (last year). Last year they added a 9th grade Design & Fabrication mandatory class, and Sarah collaborates to design the curriculum in which 100% of each freshman class is enrolled. 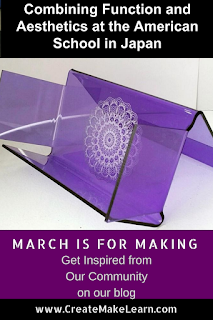 She has also designed and teaches Idea to Object, a visual arts class, geared to 10-12 graders who want to use the facility to create with a bias toward fine arts (including furniture design, product design, architecture, fashion / accessories, sculpture, etc). 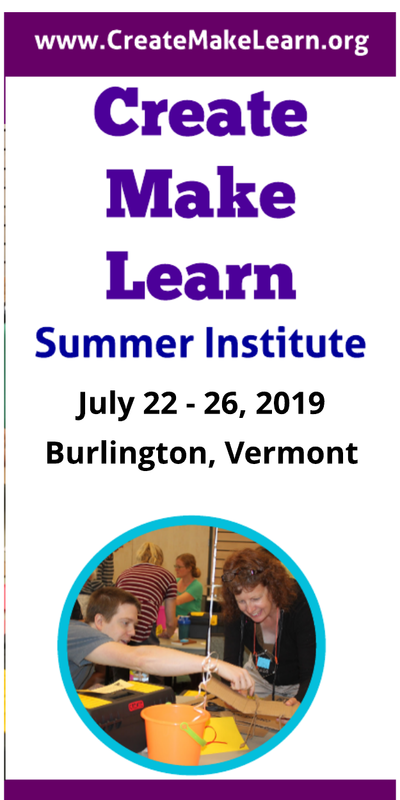 At Create Make Learn Summer Institute, Sarah will share insight into their innovative curriculum, project design briefs, assessments, and how to meet standards that align with their school strategic objectives.